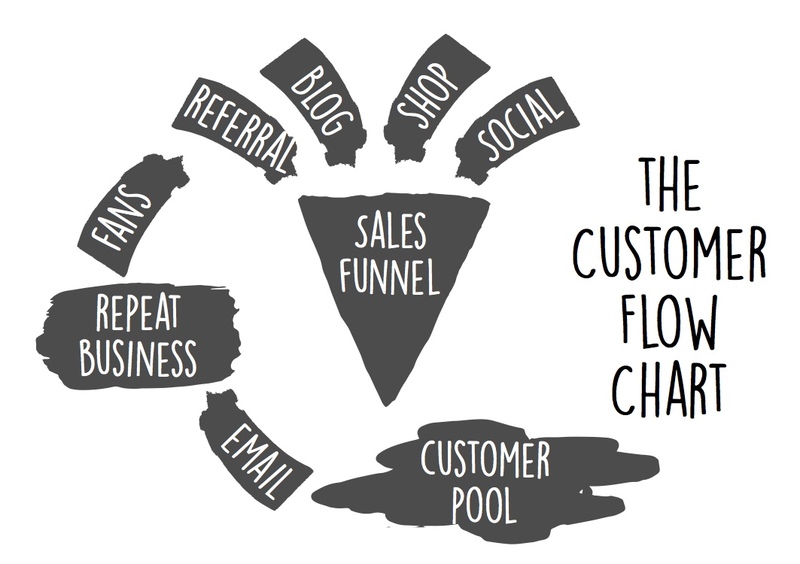 I use this customer flow chart (aka “the sales funnel”) in training all the time. In itself, the image is pretty basic. But, I like to layer bigger business lessons onto this image, as I’m going to do today. Before we get to that, let’s just take a minute to better understand how it works. At the top of the sales funnel (where you see referrals, blogs, shops and social media accounts pouring in), you’ll find the widest opening. 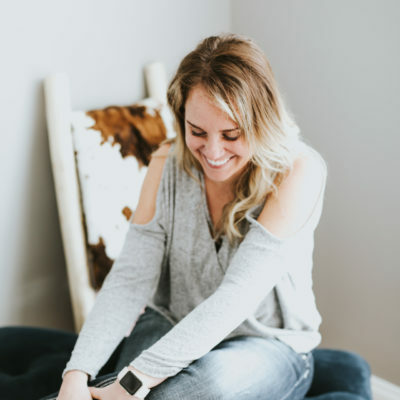 Up there, you’re talking to a lot of different people at once: you’re introducing yourself to new visitors and engaging long-time fans and customers with the same breath. When those visitors start to listen and engage with the content or products you’re sharing, they enter the sales funnel. They’re interested, or maybe even just curious about what you’re saying. They lean in; they want to know more. You start to establish trust. Beyond social media and public posts, you start to answer their questions. Your emails provide insight and value. They may not have said “yes” to the sale, but they’re definitely listening and connecting. You convert your first sale. This funnel had a broad, wide-open start, but now we’re talking about a single transaction. A new customer has entered the customer pool, and you now feel a sense of knowing one another. You’re engaged in an active exchange of energy. Finally, the follow up. Because you never want to treat a new customer as a one-off sale. The after-sale is your opportunity to build a relationship, and all good businesses are built on good relationships. While there’s a formula to a successful online business, it’s more than just a problem to be solved. And while it is simple, it involves more than just one magic component. Think of it as a machine made up of working gears: your product, the offer, the email list, branding, sales, traffic to your site, social proof, content, repeat business, etc. – they’re all gears. Each gear must be functioning properly in order to make the machine work. And when you look at it like that, you realize that your storefront / blog / website <– wherever you’re trying to direct people, is only a single gear. There’s a much bigger machine behind the curtain of a thriving online business. 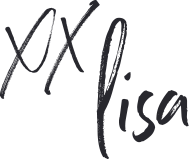 I get people to my site/listing, but they’re not buying! I’m doing all the talking; it feels like nobody’s listening/responding! Can you relate? Of course you can! Six years later, I still find myself facing a few of these problems from time to time. And that’s okay because it‘s normal. 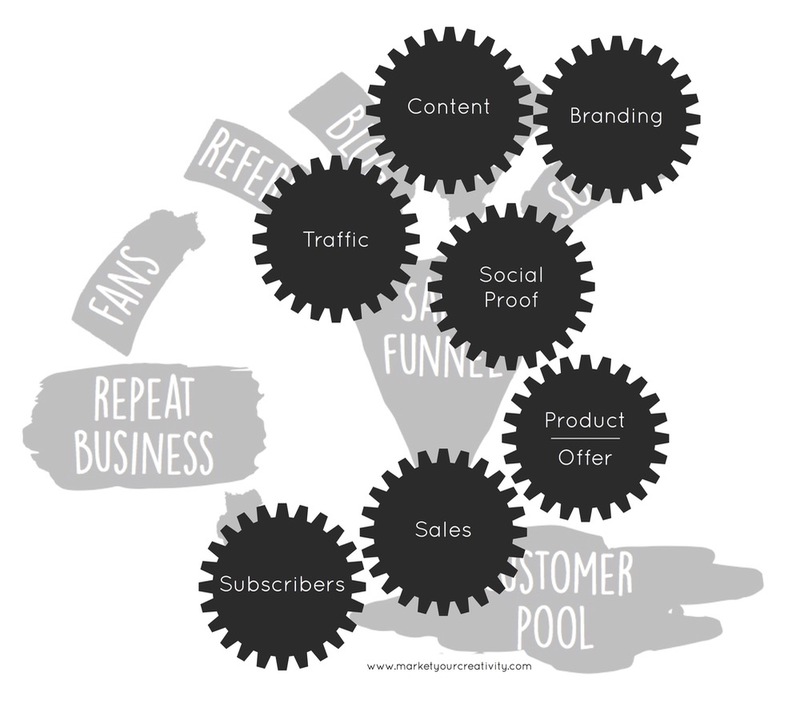 I’m going to project the necessary gears of your online business onto your sales funnel. Where is your funnel lacking customers and drying up, according to this chart? Where are your current visitors and customers falling off instead of following through? 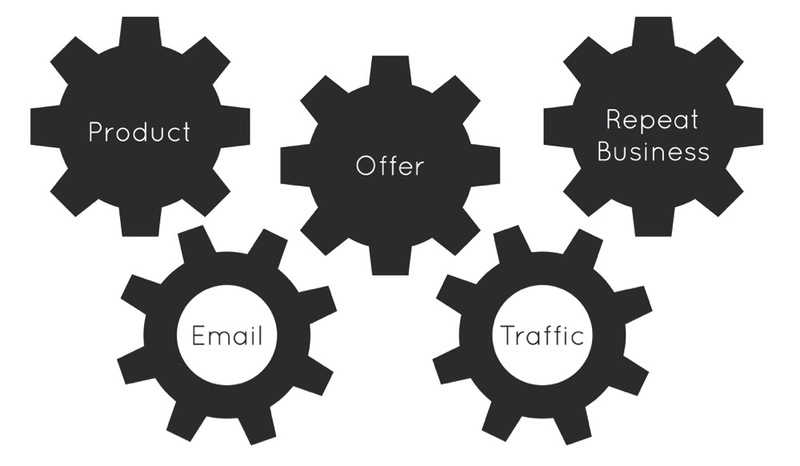 Final thought for today: What if you have all of these gears in place, but your customer flow chart simply isn’t … flowing? Thousands of online entrepreneurs are already digging in and enjoying the goods—don’t miss out! It’s time to make bold choices and demolish the foundation of your comfort zone. I want you to accomplish something that makes you unabashedly proud of yourself, and then go brag about it! If you have these four items under your belt, you already have more resources than you realize. You’ve got all of the components of a working sales machine, now it’s simply time to build it! Here’s to your most profitable year!